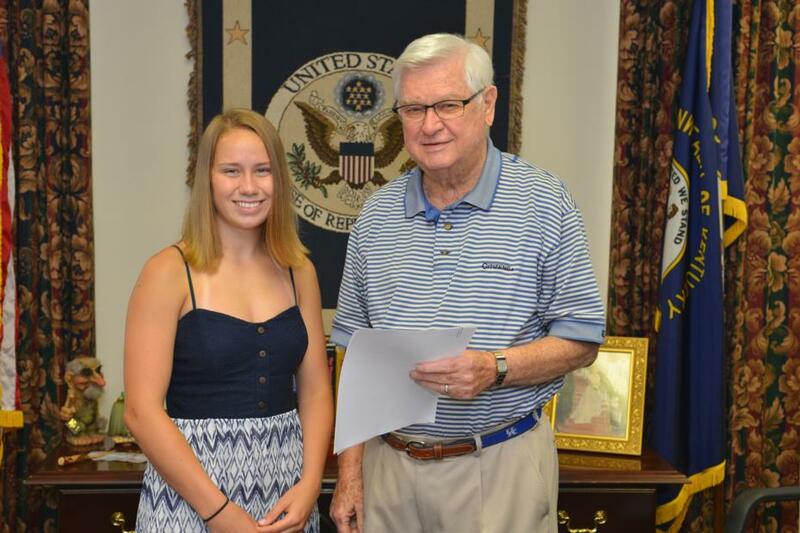 WASHINGTON, DC -- Kelsey Cyrus, a 2018 graduate from Rowan County High School, has been accepted into the United States Naval Academy after receiving a congressional nomination from U.S. Rep. Harold "Hal" Rogers (KY-05). "Kelsey is one of only four individuals in Kentucky's Fifth Congressional District who recieved my congressional nomination and acceptance into a military academy. It takes impeccable grades and a high school career marked by leadership and volunteer service to enter the ranks of West Point," said Rogers. "Kelsey was highly recommended by teachers and community leaders for her success as a student athlete, as well as her passion for serving others." Kelsey was a 2017 Governor's Scholar and previously attended the U.S. Naval Academy's Summer Leadership Camp. She was captain of the cross-country and track teams, and qualified for state in cross-country all four years of her high school career. She was also a regional finalist in swimming for two years. Kelsey was accepted as one of the U.S Naval Academy's newest cadets for the Class of 2022.